When I wrote my first, original post about CryptoLocker (“CryptoLocker Defense for Sysadmins”), I didn’t intend there to be a part 2 or even a part 3. But alas, due to the “popularity” of CryptoLocker and the recent release of CryptoWall 4.0 I decided to write a much-needed sequel to my first blog post. Part #2 differs from the first part with a different (and more simple) detection “algorithm” combined with a more reliable way to stop the “Server” service when CryptoLocker is indeed detected. Surprisingly (or not surprisingly), almost 2 years after I wrote my first article, CryptoLocker and its descendants like CryptoWall are still around, thriving, and keeping Sysadmins around the world busy. A recent report stated that CryptoWall 3.0 cost victims a combined $325 million, although it fails to mention whether this is an annual or lifetime figure. 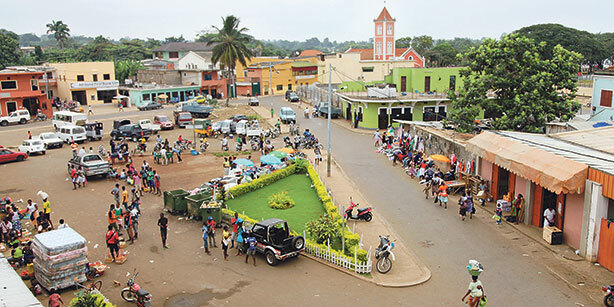 This is the same as the GDP of the small African country of São Tomé and Príncipe (population of about 200,000) in 2014. Now there is something to think about – the criminals behind the various ransomware software collected as much money as a country with 200,000 people. Alright, this is all very interesting but doesn’t help us protect ourselves from ransomware so let’s focus. In part #1 we used EventSentry’s file monitoring feature to index and inventory all files on a susceptible file share, a very accurate and resilient way to detect any sort of software which would modify large numbers of files in a short time period. While this approach works well, it does require more time to setup and may not work in real-time when monitoring extremely large directories. Consequently we’ll be using a different approach here, and we will look at yet another approach in part #3. 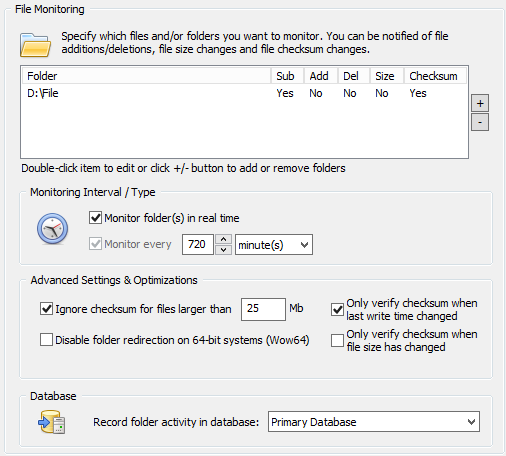 EventSentry’s file checksum monitoring feature was originally intended to monitor only key Operating System folders such as the System32 directory, but increased customer demand prompted us to tweak the feature over time to allow real-time monitoring of even very large folders (as is the case for file servers) as well. But enough of the past, let’s tackle Crypto*. Files are not only encrypted, but file names are now also mangled, making it almost impossible to link the encrypted file(s) with their originals. The encryption process seems to be less linear and less complete, resulting in some folders being left alone and thus making detection more difficult. 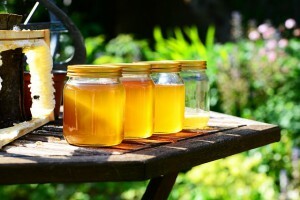 If you’ve been working in the IT (security) field for a while then you’ll have probably heard of honeypots before. Honeypots are usually systems emulating a production server with the purpose of detecting an attacker and potentially triggering counter-measures or alerts. But not to worry – we can mitigate all of the risks. 2. 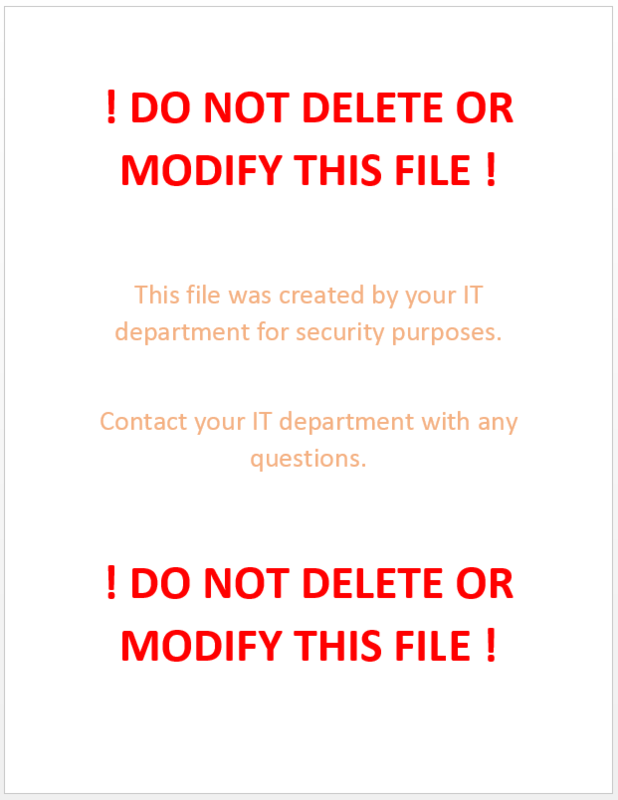 Put clear instructions into the file in large font, instructing users not to modify or delete the file. I’d recommend against mentioning any words like CryptoLocker, Virus, etc since CryptoLocker may be parsing the contents of the file. 2. Give the file a unique, meaningful name, see previous paragraph. Once you have created the file, place it strategically on your file server among other office documents. I recommend deploying multiple honeypot files if you have multiple file shares. It may be advisable to give the files unique names (e.g. meeting_notes_cl1.docx, meeting_notes_cl2.docx, …) as well. A name pattern is not required but helpful when configuring EventSentry later, since it allows you to just specify a wildcard (e.g. *_meeting_notes_cl.docx) instead of specifying dozens of files manually. This way we’ll have a higher chance of detecting malicious behavior. CryptoWall is fast (of course depending on the speed of the infected host) and can often encrypt tens of thousands of files in an hour. We will use EventSentry’s File Checksum Monitoring feature to monitor the bait files and trigger events when one or more of these files are changed or deleted (=renamed). When they are, we will trigger a script which will stop the server service on the file server in order to avoid more damage being done. Click here to learn more about EventSentry’s architecture. Monitoring files only for (checksum) changes is no longer sufficient since newer variants of CryptoWall not only modify but also rename (and subsequently delete) documents. The folder/directory name should be specified as it exists on the file server, UNC paths are not recommended. 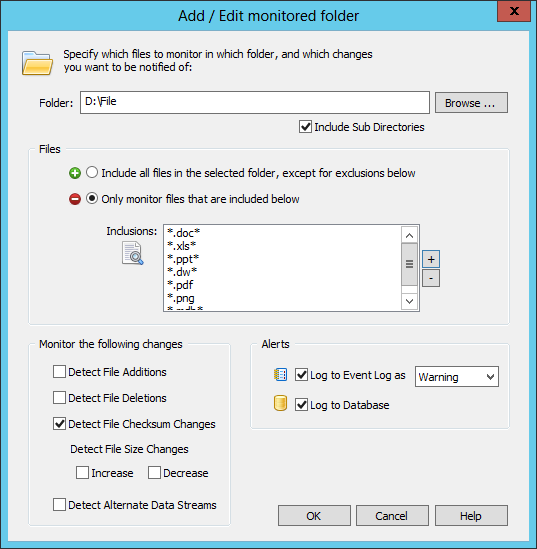 Check “Detect File Deletions” and “Detect File Checksum Changes”. File size increases and decreases may also be checked but is not required. 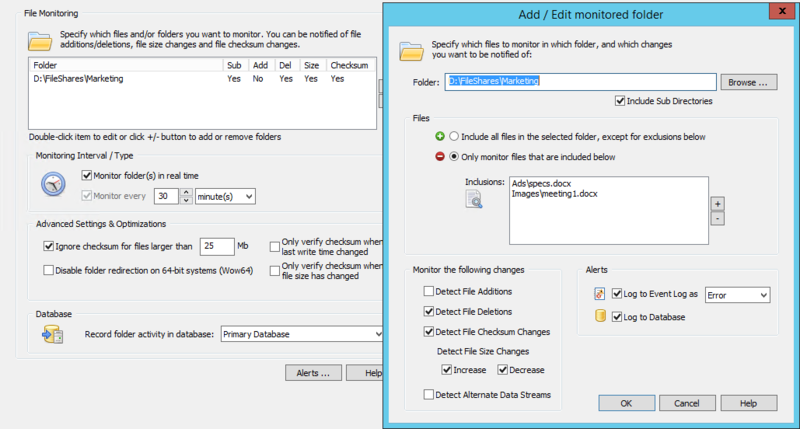 Configure the “Files” section to “Only monitor files that are included below” and specify the file name either with a full (relative) path or with a wild card. as the files to be monitored. 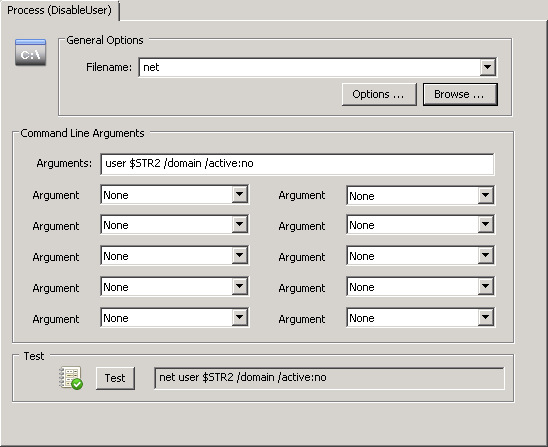 This is because we always specify the path relative to the main folder being monitored when specifying the file names. 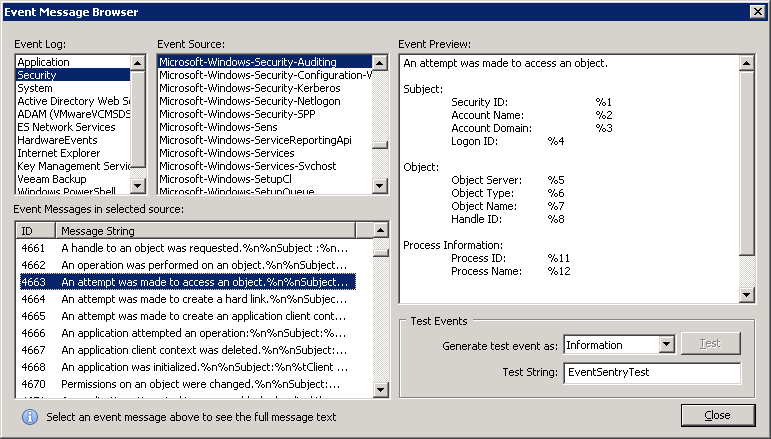 Splendid, EventSentry will now log an event to the event log when any of these files change. 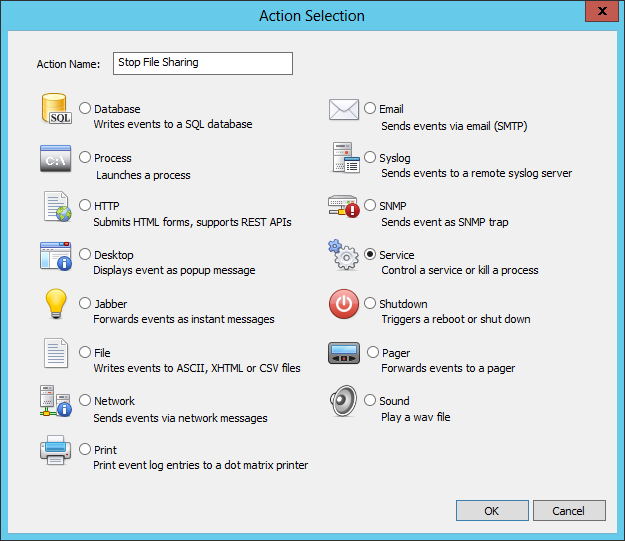 Try it out – open the file in word, make a change & save – you should get an alert in the event log almost instantly. Stopping the server service may seem like a drastic step, but it’s unfortunately the most efficient way to prevent an impending CryptoLocker infection from spreading. Sure, blowing up the bridge might seem crazy at first, but if it prevents an army of Zombies (who obviously can’t swim) from entering your town, then we can probably live with the collateral damage. You can stop a service in 2 ways with EventSentry; with the “Service / Process Control” action as well as with a custom script. 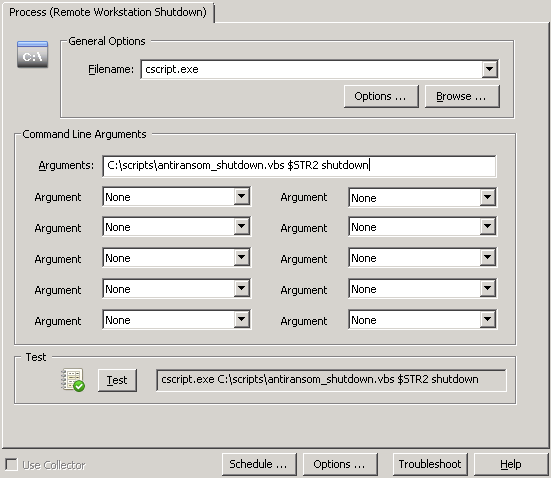 Creating a “Service / Process Control” action is easier, but only works for stopping services which have no dependencies. You can probably guess where I’m going with this – the server service depends on other services (e.g. when the “File Sharing Role” is enabled) and thus cannot be stopped with the EventSentry action. Consequently we will go a different route and create a process action instead, which essentially allows you to trigger any process, script etc. Better safe than sorry. 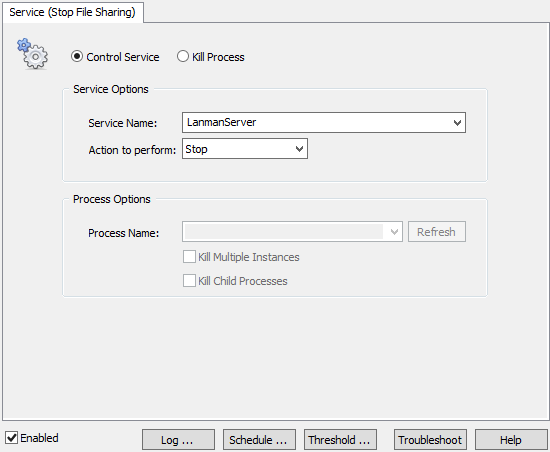 Right-click the Actions container and click “Add” to create a new action called “Stop Server Service”, and select “Process” as the action type. 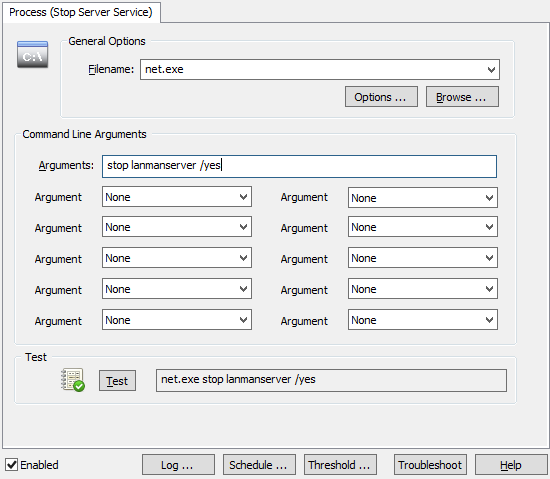 Specify “net.exe” as the Filename, and “stop lanmanserver /yes” as the command line arguments. The “/yes” switch ensures that any service which depends on the “Server” service also gets stopped. Since we now assume that a modification of one or more of our bait files only happens when a CryptoLocker outbreak is under way, the only thing missing now is to have the file change event trigger the process action and shut down the service. 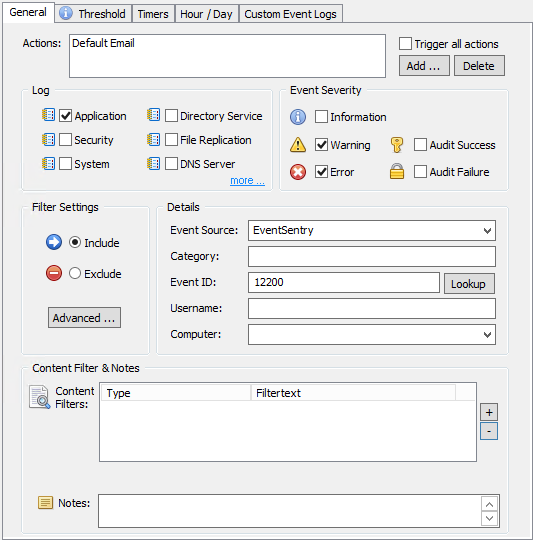 EventSentry uses the concept of “Event Log Filters” to link events to actions, such as sending an email and/or triggering a process. Filters need to be part of an “Event Log Package”, and we can now either create a new package or add our filter to an existing package. For documentation purposes and to keep things orderly we will create a new event log package called “CryptoLocker Prevention”. We do this by selecting the “Packages – Event Logs” container and clicking “Add” from the ribbon, you can also right-click that container. Give it a descriptive name and select the package, which we now need to assign to one or more hosts and/or groups. Click “Assign” in the ribbon to assign the package, you can also make the package global by clicking the respective button. With the package all ready to go, we now need to add the filter. With the package still selected, on the ribbon click the “Add” button under “Event Log” and select “Include”. 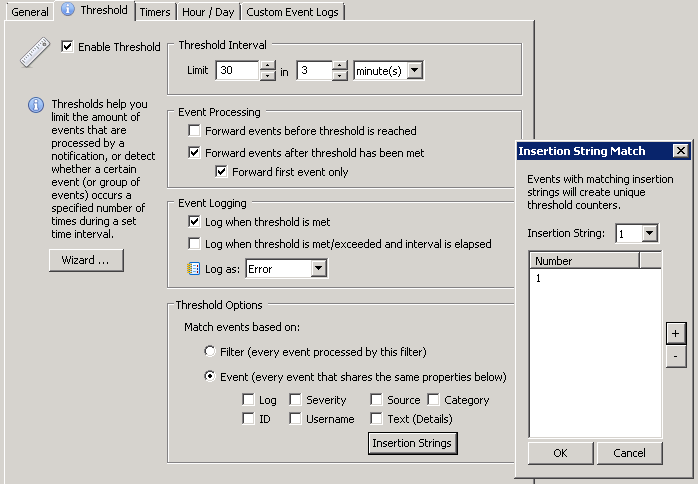 This event log filter, as is, would not apply to any event, since no event log and no severity is selected. 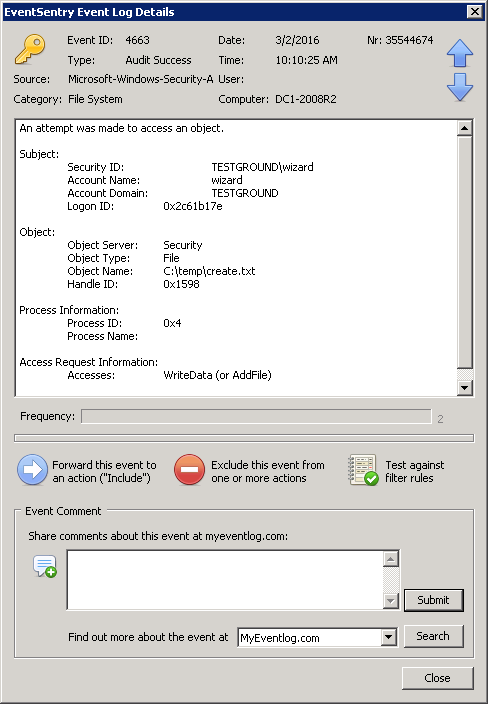 Anything detected by the EventSentry agent (e.g. 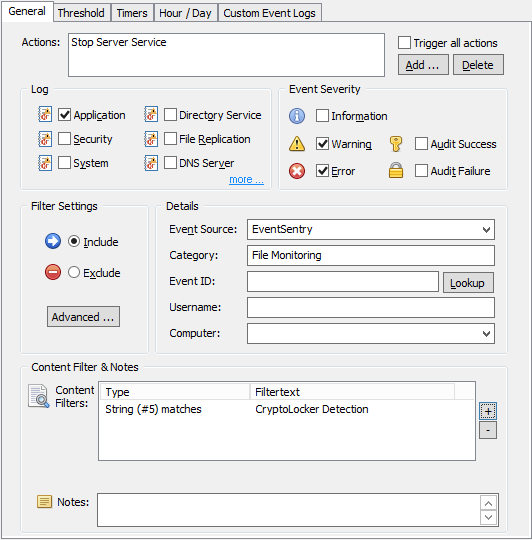 a file checksum change, service status change, low disk space) is logged to the Application event log with the source “EventSentry”, a matching category (e.g. 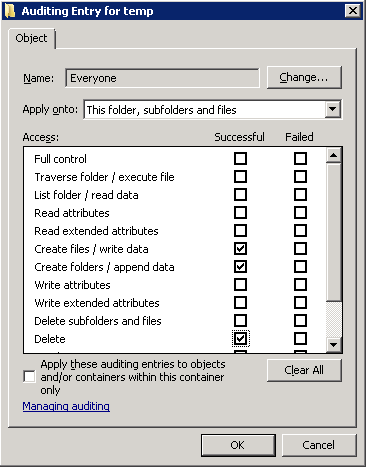 “File Monitoring”) and usually with a configurable or dynamic severity. In our case the file checksum change events will be logged as Errors, as configured earlier. We also add the “Stop Server Service to the list of actions to be triggered. Since we may have other system health packages which log File Monitoring events, we want to make sure that this filter only applies to those, which we do by restricting the filter further with an event id as well as with a Content Filter. 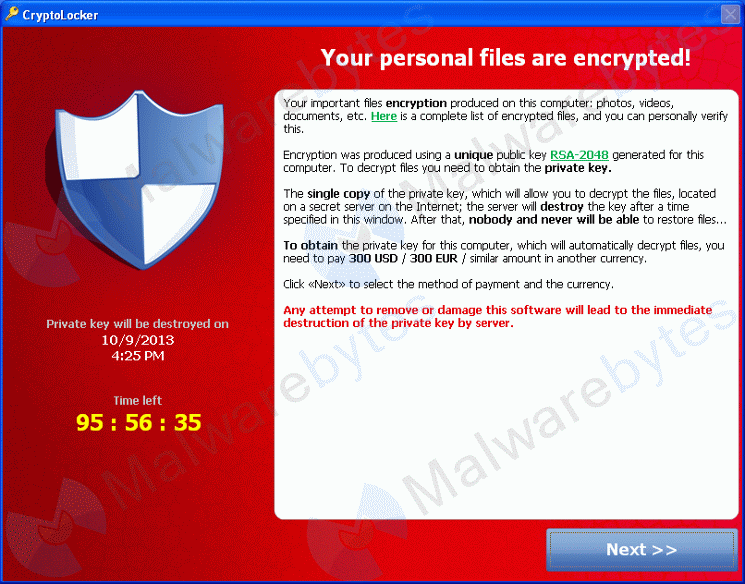 For CryptoLocker we want to get notified about every change that happens to our bait file. Whether it’s deleted, a checksum change or a file size change. As such, we leave the event id field empty and specify the “File Monitoring” category instead. Important Note: If you are running a German version of Windows, the category will need to be specified in German (“Dateiüberwachung”) since EventSentry is localized for German. Our filter could still apply to unrelated file checksum changes (e.g. OS files were changed by a Windows Update), but since any file checksum change event includes the package name which triggered the event, we can filter based on that name (we called the package “CryptoLocker Detection”) to ensure that we only match file changes from CryptoLocker. In the “Content Filter” section click the “+” button to add a new content filter. 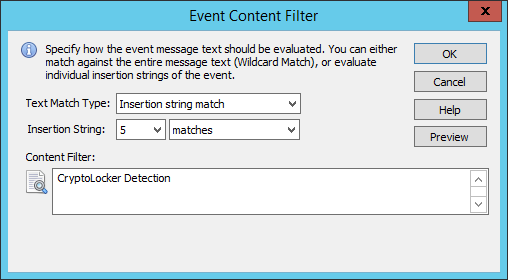 The quickest way to specify the content filter is to leave the “Wildcard match” setting in place and simply specify *CryptoLocker Detection* as the content filter. A more elegant way is to use an Insertion String match and selecting insertion string 5, which represents the package name (click “Preview” to see the insertion string numbers). 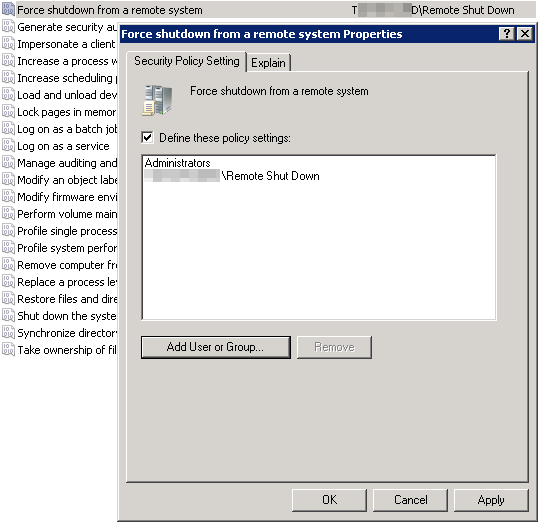 The process action doesn’t have to be duplicated, since the stopping the service is the same process for all hosts. 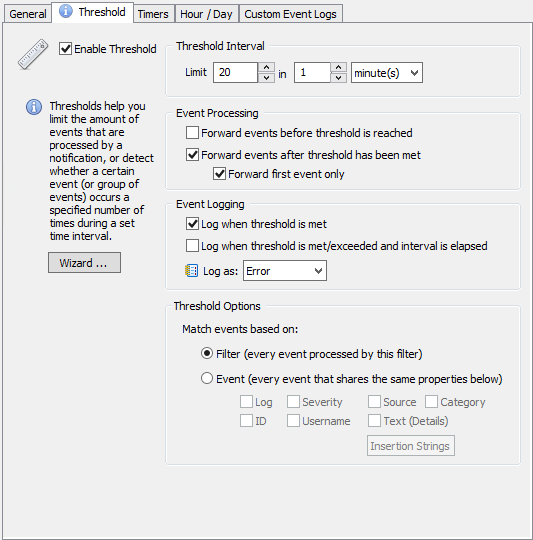 The event log filter may need to be adjusted depending on how it was setup. A wild card like *CryptoLocker Detection* would match “CryptoLocker Detection Server5” as well, but an insertion string filter would need to be modified to something like CryptoLocker Detection* in order to match multiple more than one package.